Cool, sweet and refreshing. Fruit salads are like summer in a bowl. Enjoy them for dessert after a BBQ meal or for breakfast with your morning coffee. I’ve rounded up the best summer fruit salads from my fellow bloggers. Just a warning – you are going to have trouble deciding which ones to make. Maybe try them all? I might! Do you enjoy fruit salad? I am going to have to make some of these delicious fruit salads for Summer. They look so good and a great side dish to make. These are awesome fruit salads. These are perfect for Summer! The Pina Colada Fruit Salad sounds delicious – can’t wait to try it! I love fruit salad! It’s my favorite in the summer! YUM! These look delicious! I eat a big bowl of fruit every morning for breakfast, so I’ll definitely need to branch out and try one of these! The TROPICAL FRUIT SALAD WITH HONEY LIME DRESSING sounds really good. 🙂 The photos you took are beautiful! Yum, love a fruit salad! Will have to spend some time checking out this list to get some new ideas. Great list of salads. I eyed a couple I love to try. Wow… now I’m hungry! I want to try the Vanilla Fruit Salad! I absolutely love fruit salad season. These all sound delicious! I’ve been really craving fruit salad lately since it’s my favourite time of year to eat them. I’ll be checking these out! I like the Rainbow Fruit Salad With Citrus-Honey Dressing. Very colorful and fun. I love fresh fruit salads in the summer. 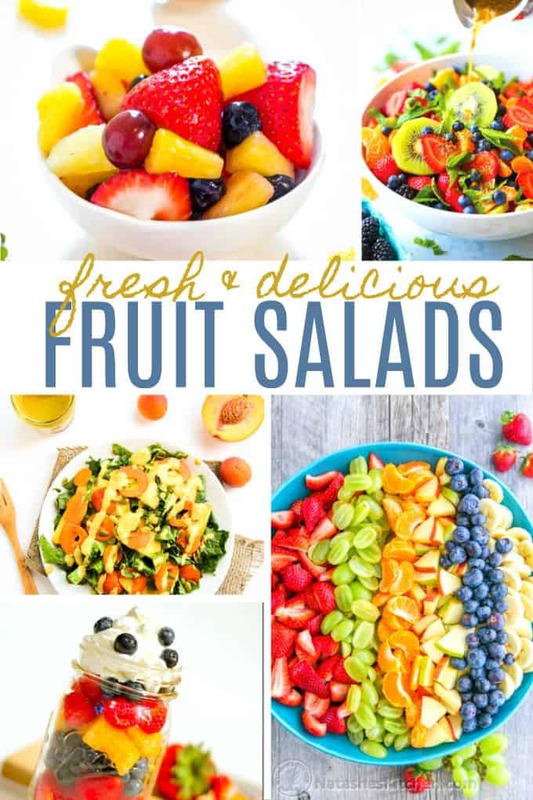 I love fruit salad and so many great recipes to try – thanks for sharing. These look so delicious!My husband and I love fruit salads for breakfast.This is a lovely collection to refer to. I’d love to try one of the Mojito Fruit Salads. Hmm lots of refreshing recipes with fruit.